As you all know if you have been reading my blog, I am an auditor. There are few perks that come with the job, but depending on the client you sometimes get lucky. Back in May and June I was working on a client that had an endless supply of snacks. This was both a blessing and a curse because it became extremely hard to avoid the drawers of cookies and chips every afternoon. When I was scavenging in the snack drawer one day I noticed a package of Milanos cookies. I used to love Milanos when I was a kid. My sister and I would go crazy for them. Of course I could not resist the temptation so I had a couple. Although I did enjoy those cookies that afternoon, I knew I could make something better. I played a round with a few ideas in my head and I think I came up with a great replica. 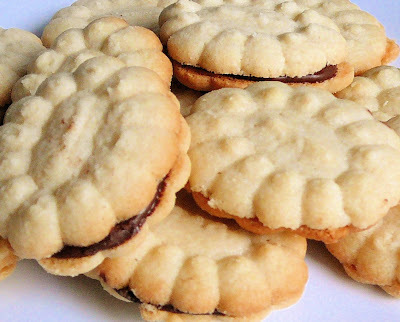 Believe me, these cookies are 100% better than the store bought Milanos and they really are not that hard to make. If you are a Milano lover like me, then you should definitely give them a try! In a large bowl, beat together the butter and sugar on medium speed until light and fluffy, Add the egg, vanilla, and salt and beat until well mixed. Using a spoon, stir in the flour until well blended. Fill the cookie press with dough according to the instructions and fit with the desired shape disk (preferably something oval to replicate the Milano shape). Press the dough out onto ungreased baking sheets, spacing the cookies 1 inch apart. Bake until the cookies are lightly golden, about 10 minutes. Transfer the cookies to wire racks to cool. 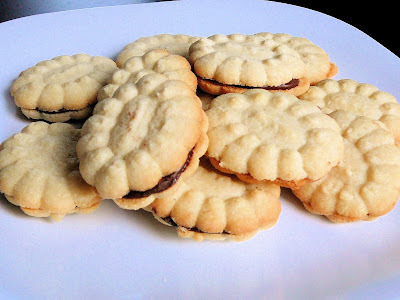 Once cool, spread the bottom side of one cookie with melted chocolate and place a second cookie on top. Repeat until all cookies are sandwiched. Makes 20-30 sandwich cookies.